At the ScreenSingapore world premiere of “Firestorm” (風暴), the film’s main stars – Andy Lau Tak Wah and Gordon Lam Ka Tung – and assorted local filmmakers dominated the red carpet. So it was a pleasant surprise to run into actor (and former Meniscus Magazine interviewee) Jack Yang, who has primarily concentrated on American productions, walking the red carpet outside of Hollywood. When we last caught up with Yang on the set of “A Leading Man” in Los Angeles, he compared his own reality to his lead role an Asian American actor who has trouble finding starring roles because of his race. As it turns out, Yang has been living in Singapore, where he is about to wrap up shooting his latest role, a turn in the English-language television series “Point of Entry” (入境点). The fourth season of the popular police drama series airs on MediaCorp Channel 5 and begins Dec. 26. 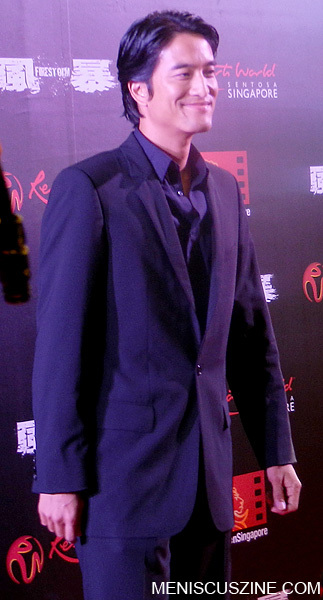 Longtime cast members have included Carl Ng (son of Hong Kong actor Richard Ng) and Jaymee Ong (who began her career when Jackie Chan signed her to a film contract with Media Asia). Jim Higgins contributed to this report.